CPS Ultra Coat® Triton is a discharge, water and plastisol ink resistant emulsion that offers textile screen printers of bags, garments and tea towels the ability to meet the continued demand for prints that have a soft feel and finish. This emulsions is also suitable for use with direct to screen (DTS) and computer to screen (CTS) technology. CPS Ultra Coat® Triton is a high quality, high solids, high viscosity, dark blue, dual cure diazo sensitised textile emulsion that’s been designed for use on polyester mesh ranging from 10 threads per cm (25 threads per inch) up to 120 threads per cm (305 threads per inch). For detailed information see the product data sheet. The emulsion is coated on to polyester screen printing mesh using a coating trough and used to create stencils for silk screen printing applications. •	Medium fast exposing Diazo dual cure emulsion. •	Discharge, water and plastisol ink resistant. •	44% solids, 1+1 coats recommended. •	New surface coating technology - improves coating quality on poorly prepared mesh. •	Reliable and durable for long print runs. •	Only 1+1 coats required for most applications. 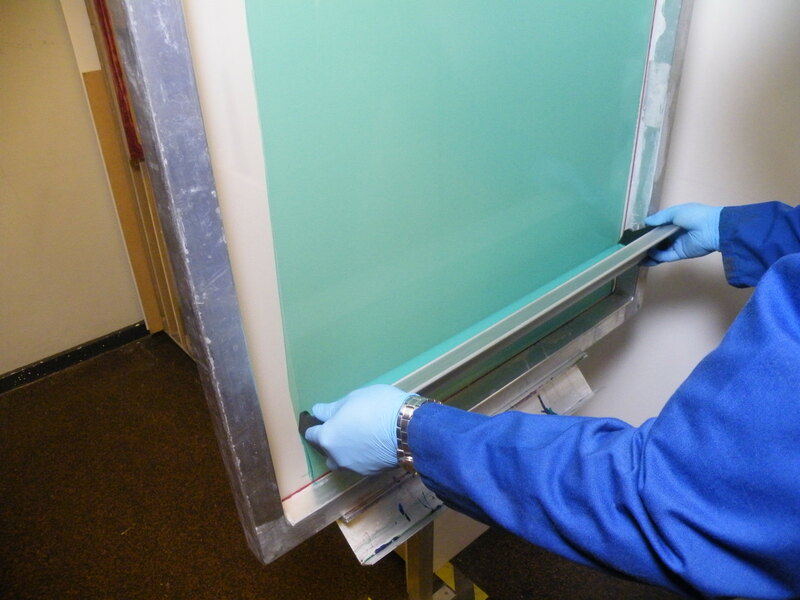 •	Fantastic coating quality on poorly prepared screens. •	Fast drying and good bridging on coarse mesh. •	Good edge definition and resolution. •	Easy processing and retouching. •	Good contrast for ease of registration. •	Easily decoated with CPS Stencil Remover Concentrates. •	Suitable for Direct to Screen (DTS) and Computer to Screen (CTS) exposure. •	Suitable for conventional and LED exposure systems. Developed and manufactured with screen printers of textiles, garments, t-shirts, tea towels, jute bags and hessian bags in mind. With a proven resistance and performance with water based, discharge, silicone and plastisol textile inks from leading ink manufacturers such as Rutland, Magna Colours, Union, PrinTop, Wilflex, AMEX etc. Whether you’re a small to medium screen printer working with ink jet positives or a modern large scale screen printer with direct to screen (DTS) / computer to screen (CTS) systems from M&R, Exile and Richmond etc. This product will meet your needs and give you a truly universal emulsion. Available in trade packs of 4 x 1 Litres (1.05 Kg + diazo) and 2 x 4 Litres (4.2 Kg + diazo) and 20 Litre drums (21 Kg + diazo). Hazard Label: Warning (Irritant to skin). Textile screen printers looking for a reliable, durable, universal emulsion with high solids and great coating quality that will allow them to create highly detailed screen prints with a soft hand finish. Screen printers who are GOTS (Global Organic Textile Standard) approved and looking for a durable and water resistant emulsion for screen printing onto organic cotton. Recommended coating regime is 1+1 on mesh counts ranging from 77 to 120 threads per cm. CPS endorses best industry practice that operators should wear appropriate personal protective equipment (PPE) when handling all chemical products, even those classified as 'non-hazardous'.Recommended PPE for CPS Products includes gloves and safety glasses (or goggles when handling larger quantities).